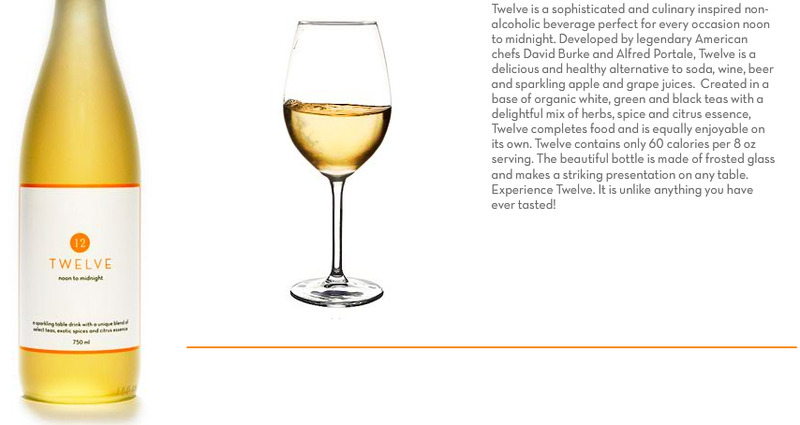 Twelve Beverage is the intelligent alternative for every occasion, featured in the NY Times, Today Show, Pregnancy Magazine, Modern Bride and dozens of other magazines. Twelve is a non-alcoholic drink meant to be a culinary beverage. Twelve is a sparkling blend of fruit juices, white, black, and green teas with a unique recipe of exotic spices, herbs and citrus essence, with traces of pepper, sea salt, juniper berry and fennel. 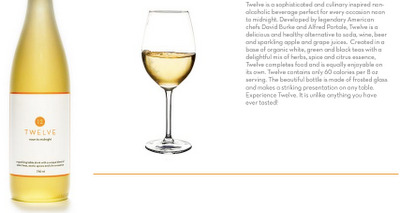 Twelve’s delightful taste can be enjoyed as an independent beverage, or accompanied by your favorite gourmet meal.